Find the Global Lives Project at UC Berkeley's 2018 Cal Day! 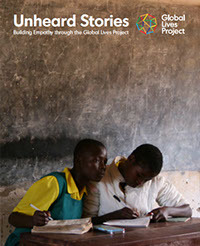 Founded in 2004, the Global Lives Project serves as a video library of life experiences across more than 17 countries. The project explores the diversity of human experience through uncut video footage and encourages discussion, reflection, and inquiry about the wide variety of cultures, ethnicities, languages, and religions on this planet. Ultimately, Global Lives seeks to foster empathy and cross-cultural understanding. Today, the Global Lives Project showcases 24 hours in the daily life of 20 people from 17 countries around the world ranging from a college student in Tokyo and a traveling clown in Spain to a sand barge worker living in Vietnam. These exhibits display raw footage from the various shoots as they go about 24 consecutive hours in their lives. The Global Lives Project exhibit is also on display at the Phoebe A. Hearst Museum of Anthropology and is coming to the Haas School of Business’s Cafe Think this summer 2018.